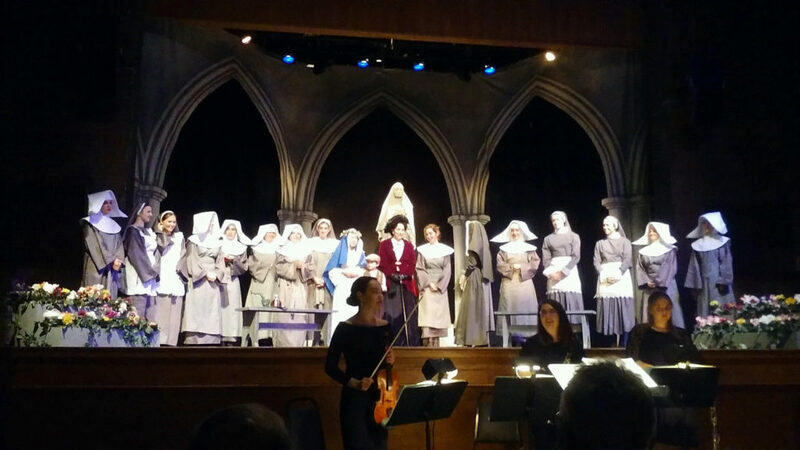 The house was full nearly every night for the fall opera production of Sister Angelica staged in Ward Hall by the Rome School of Music, Drama, and Art. Sister Angelica is a one act look into a young nun’s life, the convent community that surrounds her, and the unexpected tragedy that kills her. The tale portrays a small religious community in Italy. After sketching a cursory picture of everyday mundane convent life, the story dives into the poignant details of soul of the title character, Sister Angelica. Early on in the opera, it is revealed that she was a rich noblewoman in her past life, but was sent to the convent as punishment for having a child out of wedlock. She has been waiting to hear news of her family for seven years. The opera builds to its climax when Sister Angelica’s aunt, the Princess, visits the convent and mentions that the nun’s young son has died. Sister Angelica has been pining after her baby ever since she entered the convent, and cannot handle the news of his death. Out of the sight of her fellow sisters, she mourns the loss of her child and commits suicide by drinking poison. The Rome School’s production harnesses the music and visuals of the opera, allowing them to enhance the story, and tell it in a way that words never could. One of those visuals was the larger-than-life statue of the Blessed Virgin Mary, which was the focal point of the production. The characters that populated the stage often directed their prayers and thoughts to this statue. The disciplinarian of the convent would admonish her nuns in the name of Mary. Most notably Sister Angelica, in her final moments, begs Mary to forgive her for taking her own life. The rest of Hampton’s insightful blocking only enhanced the idea of the Virgin Mary as the focal point of the story. The opera included scenes where the sisters were huddled together knitting, reading, tending the garden and engaging in other ordinary activities under the protective shadow of the Blessed Virgin. In contrasting scenes, when the Princess’ visit begins to cast a gloom over Sister Angelica’s peaceful convent life, Mary is still present. Hampton had various cast members stand in a half circle, forming a wall to distinguish the visiting room from the rest of the convent. This simple tableau eloquently communicated the coldness and solitude that Sister Angelica experienced in that scene at the hands of her aunt. However, the “wall” was not tall enough to block out the merciful figure of the Virgin Mary. When Sister Angelica chooses to take her own life and drinks poison, she panics and asks for the Virgin’s forgiveness. Here, the figure of Our Lady is represented again but this time in the form of a living actress. In this final scene, Mary brings Angelica’s son to welcome his mother into Paradise. The cast, chosen by the vocal committee, was highly engaging. Cast members such as Tara McDermott, E. Noel Garrard, Sol Pennance-Acevedo, Nina Dorsett and Katie Malone all had a very energetic stage presence, and clear insight into their characters. Their vivacity helped to depict a convent of complex characters who were all striving for holiness in spite of their many shortcomings. “I was more than pleased to experience the young talent hiding within our student body,” Nathaniel Goonasekeram, a sophomore electric engineering major said. Gabby Arencibia, who played Sister Angelica on the Thursday and Saturday nights of the show’s run, was easily a standout performer of the show. She made her music sound effortless, drawing her listeners’ attention to the beauty of the music rather than its technical difficulty. Her physical portrayal of Sister Angelica gave off a striking air of vulnerability. Arencibia made the character of Sister Angelica very sympathetic, inviting audiences to fully appreciate the character’s torrential journey from despair to redemption, and ultimately the Blessed Virgin’s mercy. The flow of the succinct opera is an essential part of the show’s artistic power. In just under an hour, we see Sister Angelica go from an obscure nun in her convent to a multilayered figure, balanced between despair on earth and joy in heaven. The beauty and relatability of her journey is palpable, and reaches across the language barriers of the Italian text. “You didn’t even need to know what they were saying,” said Hartmann. The music alone was necessary to tell Sister Angelica’s tale of redemption.